When Troy and I removed ourselves from our old lives of living and working full time in Toronto , it allowed us to reflect on some tasks we ‘performed.’ Tasks that became automated and what now seem incredibly absurd to us. Why are travel bloggers talking about groceries? 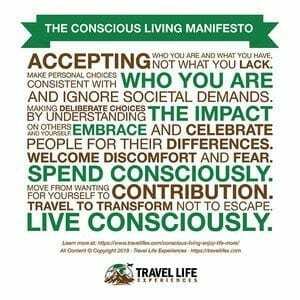 Because by removing ourselves from our past lives and routines, we broke the cycle. 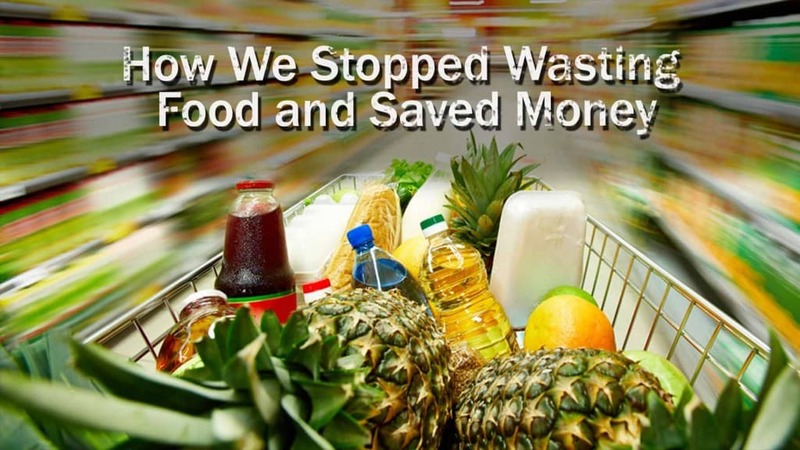 We want to share our insanity and how we stopped wasting food and saved money instead. I cringe at our past days of stocking a fridge full of food each week, fully loaded on every shelf, with a door crammed full of stale-dated condiments of sauces and marinades that didn’t pass the test of good tasting. Half of the vegetables in plastic bags were wilted, soggy or browning and they ended up in the garbage before they would see our stomachs. Of course, not to mention the freezer stacked with unrecognizable items, disguised in freezer burn. What a waste of food, a waste of money, and wasted hours of guilt on frivolous living, instead of responsible living. Back then, we were too busy fixated on other things, unconscious of what we were doing. 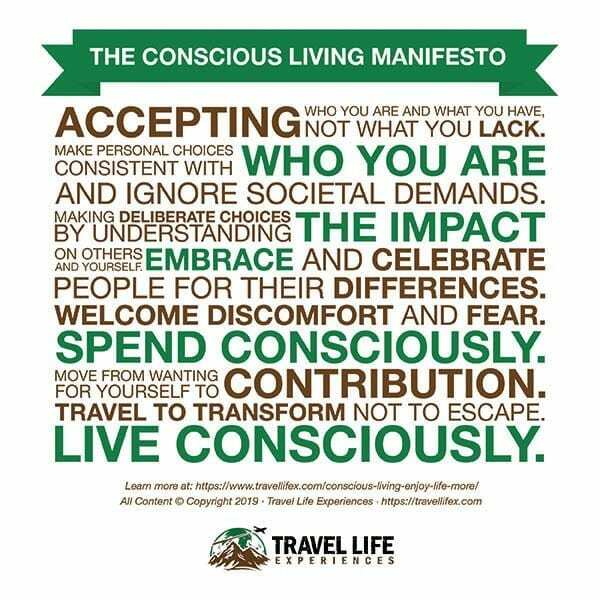 Our change in finding space to see what we were doing, choosing a simpler lifestyle, and living and traveling in more temporary accommodations has made us both think differently about What we buy, How we buy, and When we buy. According to the UN food and agricultural organization, North Americans are throwing away 41% of their groceries at home. We are all culprits of this, while families around the world are challenged to just put food on their tables. What we thought we were doing was saving us time. Instead, we were buying inefficiently, thus irresponsibly wasting food and wasting money. After this painful self-awareness, we started on some new buying habits that work better for us. We plan differently. We now only go shopping for just one week of meals. We go to the store to buy only those items on the shopping list. Based on our old ways, we estimated that 7/10 times the extra item that was in our cart usually result to throwing out something from our groceries for that week. Or usually, it was junk food that was chosen instead of a healthy snack. We stopped buying items we should eat, instead of ones we regularly eat. I can’t remember the countless times we picked up extra vegetables, fruits or food items because they were good for us and we wanted to try them, or we had ambitions to create a unique food masterpiece. Yet, they end up often untouched. Now, if we do buy something new for variety, it will be part of a recipe already planned for the week. We started walking to the grocery store. Now that we no longer own a car, this is an easy choice. The same idea applies to taking transit. This small change forced us to buy limited items, which results in using everything in our fridge and cupboards, not to mention the exercise. We carry a backpack for the heavy items and our reusable (and foldable) duffle bags for the rest. We find ways to use up items at the end of the week. At the end of the week, we usually make a stir-fry of leftover items, or we use our blender to add any greens that starting to wilt into our blended smoothies. We make everything visible. 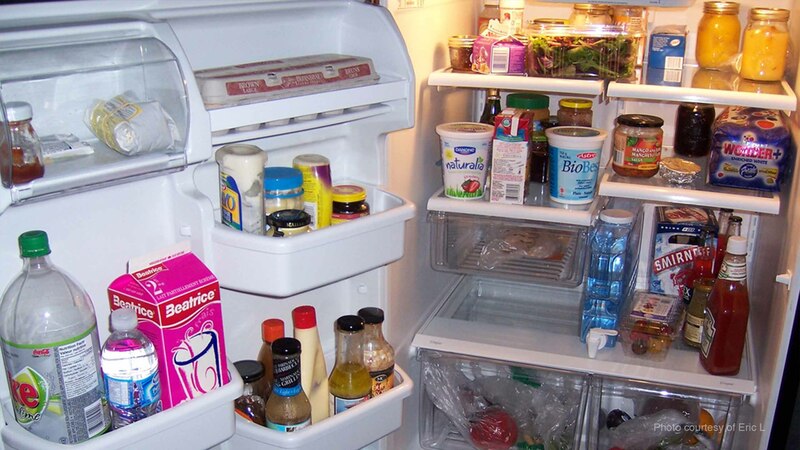 We line up everything in our cupboard and fridge so we can see it. If you buy each week, it makes it easy to find room for everything. 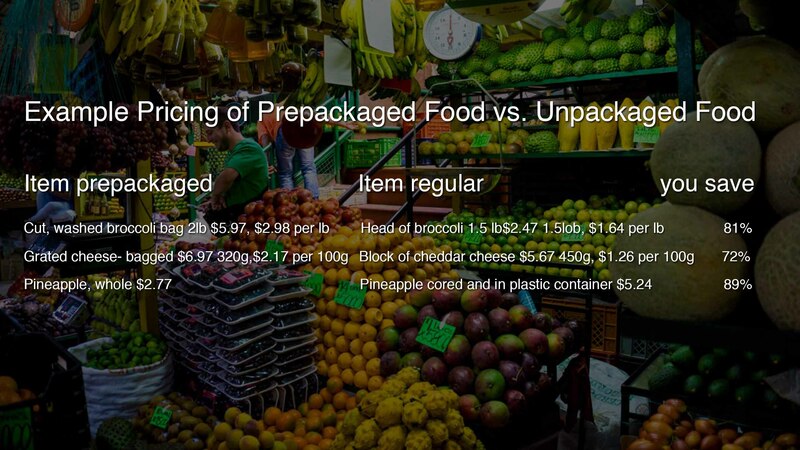 We buy less pre-packaged food. Although it saves time, we avoid paying the significant premium and avoid throwing out plastic. Finding only fifteen minutes to cut, wash and store in a produce drawer (or plastic bags) significantly increases your chance of using up these foods, and grab on the go. Here are a few examples of how you can save by buying food unpackaged. The example below reflects only prices in Canadian dollars, on-line pricing Loblaws. You can see how expensive food in Canada is, although in the U.S. there is still a significant savings between pre-packaged vs. regular food. 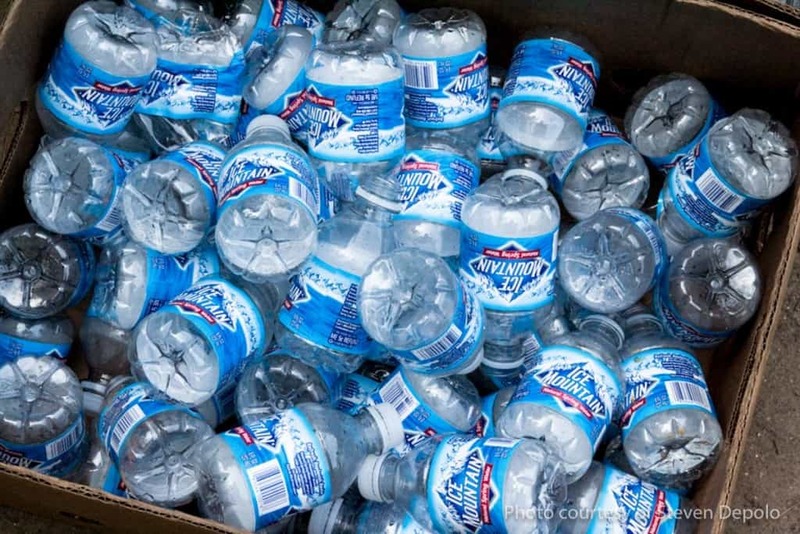 We avoid buying bottled water. Not only are plastic bottles the worst environmental atrocity, but we also started drinking tap water wherever we can and refilling bottles. Brita water filters are an excellent way to filter your water. Troy and I have seen how bad the plastic problem is in the world. Here are some startling plastic facts that show how plastic is everyone’s problem in the world. Going out to eat – Need I say more? We used to go out at least 4 to 5 nights a week. It was an escape for us, a distraction from the stress of work. It costs us at least $60-80 each night or more, especially if we are out longer into the night consuming more drinks. Now we do it much more infrequently, and our intentions are different. We do it as a treat, and to explore a new place while we are traveling. We love the enjoyment of eating a home-cooked meal when we stay at a guesthouse or an apartment with a kitchen. The internet offers so many options to create simple meals with few ingredients. One of my favorites is the RealSimple website. 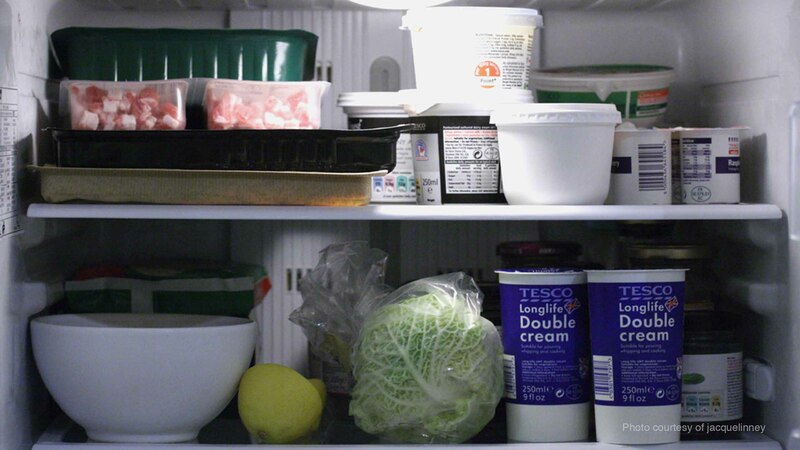 What are your experiences where you stopped wasting food and saved money? Keep track of what you throw out, so you know what to avoid in the future. What are your results after a week or a month? Perhaps the money you spend on wasted food can be put towards an activity you love to do/see/feel or experience? For more money saving tips, you can find them here.